YOU BETTER WATCH OUT… KRAMPUS IS COMING TO TOWN. Ancient folklore warns of a mythical counterpart to Santa Claus, who punishes naughty children every Christmas… his name is KRAMPUS. Michael Dougherty presents the official graphic novel based on his festive horror comedy, which expands the mythology of this iconic terror with an anthology of three deliciously twisted morality tales that will leave you praying you are not on the naughty list. At the most wonderful time of the year, a drunken mall Santa comes under siege from some very mischievous Christmas spirits, a dysfunctional cop becomes trapped with the man who ruined his life and the wealthy town “scrooge” must face the shadows from his past as his home comes under invasion from the homeless. This Christmas, Krampus will make sure they all get what they deserve. Michael Dougherty, the writer/director behind cult horror hit Trick ‘r Treat, is joined by a fantastic team of creators, uniting Krampus co-screenwriters Zach Shields and Todd Casey and artists Fiona Staples (Saga), Christian Dibari (Hoax Hunters), Maan House (Witchblade), and Stuart Sayger (Bram Stoker’s Death Ship) to deliver a twisted gift for the holiday season. 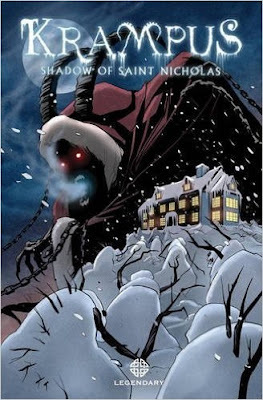 This is the comic anthology connected to the new movie, Krampus, releasing Friday, December 4th, , day before Krampusnacht (the night of Krampus). Besides Krampus, Michael Dougherty, is behind the Halloween horror flick, Trick ‘r Treat. Krampus has come to town one night, bringing to life monstrous toys and devils. The first story has a store Santa full of disillusion and alcohol who finds purpose again like he did back in Vietnam to battle some dark and not so human denizens. In the second tale, a cop becomes trapped with the man behind the hit and run death of her sister years before. The last one concerns what happens when a rich man has his home invaded first by the homeless, then something much scarier. Still missing a good scary read? Still pining for Halloween? Don’t worry, for Christmas is also famous for scary stories. And Krampus: Shadow of Saint Nicholas will make you wonder if you’ve been bad enough for a visit from Krampus too. Gruss vom Krampus! I was wanting to see Krampus. I'm not usually big on holiday movies this I like the looks of this one.